Currently the largest network of primary care providers nationally, federally qualified health centers doubled the number of patients served over the past decade, creating the need for facilities expansion. Health centers added approximately $11.1 billion in leased and owned buildings, property, and equipment, from 2008-2012, a growth trajectory that will continue with Affordable Care Act (ACA) implementation. 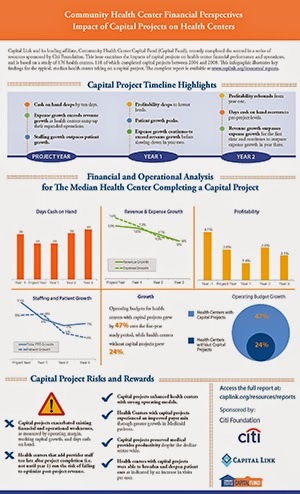 To determine the effect of this growth on health center operations and financial performance, Capital Link and Community Health Center Capital Fund (Capital Fund) completed a study of 118 health centers over a five year period. Impact of Capital Projects on Heath Centers: Growth, Financial Trends, and Operational Transformation, is the second topic in a series of resources sponsored by Citi Foundation called Community Health Center Financial Perspectives. The study provides insights such as: How fast do health centers grow after a capital project? What are the potential pitfalls? How large should cash reserves be to mitigate possible losses as a new facility ramps up? How fast do other health centers add staff and how does that affect the bottom line? How much debt do other health centers support when they take on a capital project and how much equity do they usually raise? The analysis also addressed the issue of project size, and how this factor may affect health center finances and operations. Two reports were produced to discuss findings relevant to different audiences: (1) community health center leaders and (2) lenders and investors. The health center guide (issue 3) offers information to assist health centers with capital planning and financing processes. A lender guide (issue 4) will be released soon which offers a data-informed analysis for lenders as they underwrite health center capital projects. Key findings are illustrated in our infographic. The complete resource document with detailed financial and operational metrics and trends is available at www.caplink.org/resources/reports.